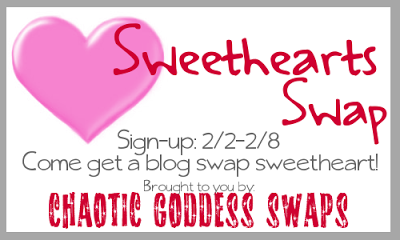 Miss Angie and Beth are hosting a Sweethearts Swap and I can't wait! :D I went to some of my favorite stores this year to find Valentine's *fun-ness* but so many stores have either cut way back on their Valentine-themed inventory or have dropped it altogether. I've been shocked about it, and other folks have noticed it, too. I can't wait to start shopping. So have you seen many Valentine's Day goodies in your town? Maybe I should visit and shop with you if you have!